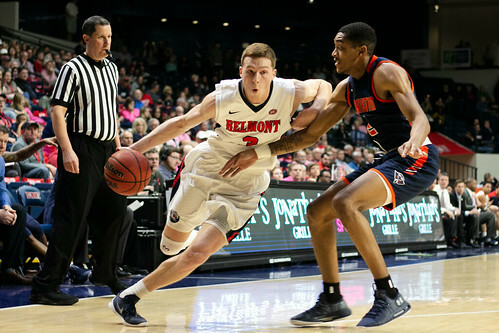 The Belmont men’s basketball team secured an 82-65 win over UT Martin Saturday thanks to a strong second half performance. The Skyhawks kept it close throughout the entirety of the first half, shooting well from the 3-point line and only trailing Belmont 40-32 at halftime. It didn’t take long for senior Dylan Windler to hit some threes that helped the Bruins run away with the game in the second half. Windler picked up his third straight double-double, scoring 23 points and grabbing 13 rebounds. Senior Kevin McClain has played some of the best basketball of his career the past few weeks. McClain has scored 20 or more points in four of the last six games, and he scored 23 against the Skyhawks. Freshman Nick Hopkins played one of his best games all season, with 15 points and four rebounds. Hopkins shot 5-9 from from behind the arch and is leading the team in 3-point percentage with 40.5. The Bruins are currently in a three-way tie for first place in the OVC along with Austin Peay and Jacksonville State. Belmont will hit the road for its next four games, starting at Eastern Kentucky on Thursday at 6:30 p.m.. The two teams last met on Jan. 12, when the Bruins won in spite of Colonels superstar Nick Mayo, who scored 26 points. Photos by Carina Eudy and Megan Garvey.